The logo is on the left on all my notifications emails. How can I easily center it - has to be responsive too in mobile. Katy here from Shopify! Congrats on your first post here. You can adjust the logo in your order notification emails by adding some styling to the <td> tag which is already present. This should work on both desktop and mobile for you. I put in this information too ( <td class="shop-name__cell" style="text-align: center;">), but it still shows the Order# on the same row on desktop. It looks great on mobile (just like the screenshot you shared). I have 5+ years of working experience in shopify development. please connect on skype so that we can discuss further. Thanks so much for getting back to me on this, and I am sorry to hear it is not appearing correctly for you on desktop. I have taken a further look and have a solution that can help with this. If we append block to both this line of code, and also the code below containing the order number, we can then stack them together which should do the trick! Apologies for the confusion and do please let me know how this goes for you! Perfect, it worked. Thank you so much Katy! The above was super helpful, thank you! Wondering if there's a way to centre all the copy in notification emails, in particular the attached top part? Thanks so much for chiming in here, and I am glad that you found the above steps helpful. This will feature around 7 times on the page. The one that we will need to adjust is the 2nd container. This should do the trick for you for most of the text. In order to center the order number, you will need to do this separately. This is to ensure that the 'span' element is correctly centerd. Do let me know how it goes for you - I'm happy to help in any way that I can. 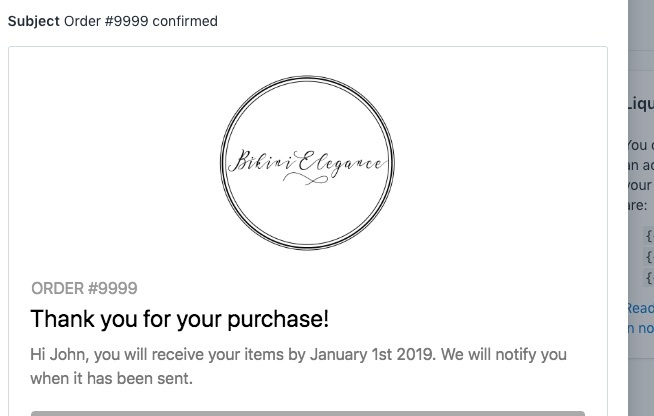 One last thing - is there a way to centre the "View Your Order" or "Visit Our Store" buttons that sit underneath the text as well? Thanks so much for your reply @Brittany5! If you could access your template once more, and search for actions__cell. You should find this twice in the template. Here we will only need to adjust the first one. This should then do the trick for you! Let me know how it goes or if you have any questions.